Audrey Claire makes me want to be there. 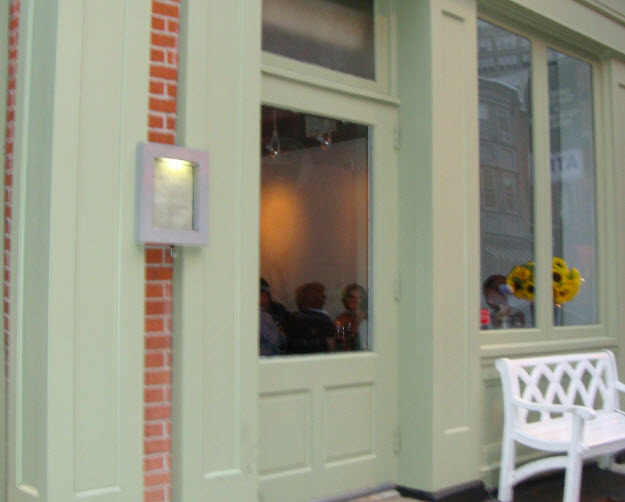 Something about the light green facade, large windows, outside street seating, and a granny smith apple on each table to pull it all together, pulls me in every time. Although I ride past the restaurant almost daily, I didn’t even know the cuisine served. When I stumbled across another blogger’s post title “the best (philly)”, Audrey Claire, in their view was not only best BYO, but also Best Place for Date. And to to top it all of us, it was Mediterranean (nothing exceeds my love for hummus). That sealed the deal, and a few days later my boyfriend and I were sitting outside. On whats turning to be normal Philly day, the 85 degree sticky weather, made sitting outside a little uncomfortable. Sitting inside, unfortunately, felt like the same 85 degrees but cramped and with loud talking. We were quickly offered water outside and the water was replenished constantly. That is appreciated, but perhaps the highlight of our visit. 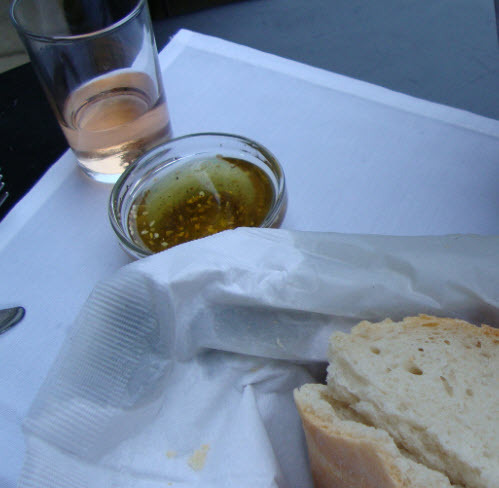 After cooling down with water and getting started on our rose, the bread and oil were brought. The bread was crusty on the outside and soft on the inside, but when its humid, bread for us, is too heavy. This logic does not apply to pita bread. 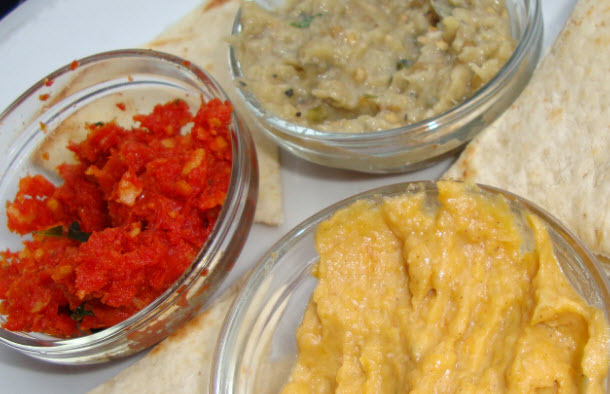 We decided to start by sharing the 3 dips and pita, choosing: Sundried Tomato and Garlic, Pumpkin Hummus, and Babaganoush. The sharing turned into just for me because my boyfriend didn’t like a single one. Yes, he usually like hummus and dips. Personally, I liked the pumpkin. It had a smooth texture, and none of the rawness of pureed pumpkin. The sundried tomato and garlic was not a spread but chunks and I’m glad we still had the crusty bread around because it didn’t belong on the pita. The babaganoush was gross. It had the bitter taste that you get when you don’t remove parts of eggplant. For our next course, we decided to share the special salad of the day with watermelon, feta, and mint. This at least was refreshing, but lacked the finesse of a pulled together dish. I can slide feta and watermelon at home too…at a restaurant I would expect some sort of light dressing to pull it together. The bites with all 3 ingredients were delicious but with only 2 mint leaves, those weren’t too many bites. Again, for our main, we decided to share, and ordered the feta and garlic crusted baby rack of lamb with fresh mint and dill labne. We had both interpreted the feta and garlic to be a coating…similar to black sesame seeds on tuna. I was shocked when we received, basically fried lamb. It was a think coat of breading, greasy, and turned the lamb meat into a flavorless lump. We received 3 lollipops like the one pictured above and I left my boyfriend have at them. I tried one and decided to pick at the crusty bread from the beginning of the meal instead. My boyfriend was none to happy with the dish but after ignoring the dips and salad, he was hungry enough to eat fried lamb. In short, the outside is cute, its the worst dinner I’ve had in Philly so far, and the service leaves a bit to be desired.